bThere’s a new atheist choir in Los Angeles. They call themselves the “Voices of Reason.” They sing the “Evolution Chorus” to the music of Handel’s Hallelujah Chorus. They sing “Every Sperm is Sacred,” from Monty Python. The poor dear. Christmas music is so very damaging, isn’t it? I’m not sure what she means by “soul,” though; I thought most atheists didn’t believe in a human soul. I suppose she meant her psyche, which is fair enough. Spirit, soul and psyche are all connected in the Bible’s original languages. It took modern man to find a way to rip them into separate categories. Anyway, she wanted to join an atheist choir. She thought there’d probably be lots of atheist choirs around L.A. because it’s “a pretty progressive, nonreligious town.” She was wrong. There weren’t any, so she helped start one. She picked up on the name “Voices of Reason,” which had been used by a previous atheist group, since gone defunct. Music isn’t for reasoning. It’s for filling up gaps in the soul where logic can’t reach. During the run-up to the Reason Rally I helped put together a book, True Reason, in which several authors united to show that the New Atheists’ claim to reason isn’t all it’s cracked up to be. In a word, their arguments are riddled through and through with factual failures and logical fallacies. Still, the “reason” thing seems important to their self-image. But really, now: “Voices of Reason”? “Reason Through Song” — as the interview is titled? Sorry, but no. I’m a musician, and people also tell me I seem to know something about logical reasoning. And I know that music isn’t for reasoning. It’s for filling up gaps in the soul where logic can’t reach. A song meant strictly for reason is bound to be cold, dry and lifeless. To me it smacks of computer-composed music — which is a real thing now, if you define “music” loosely enough. The computer/human “Can you tell the difference?” test I ran across recently was too obvious to bother with. You don’t get heart from an algorithm — not even an algorithm riddled with fallacies. As for the “Evolution Chorus,” there are two issues. One, who could honestly get that excited about evolution? Even its most committed cheerleaders describe it as random variation — luck, that is — leading to the survival of those who survive. They call it “natural selection,” which means exactly, “those who survive and get to reproduce, get to survive and reproduce.” They also call it “survival of the fittest,” but “fittest” means “most likely to survive,” so it comes out meaning the same thing. And you’re going to burst forth in glorious song for that? Honestly, it gives me a stomach ache. My wife calls it sacrilege. She’s right. If anything, they’re celebrating themselves, their “reason.” They’re congratulating themselves for believing in evolution. What else is there to get excited about? And why would they want to ruin the greatest piece of music ever written (my opinion), the most exuberant celebration ever produced, written for the one Person most infinitely worth celebrating? I mean, which is worth getting excited about: The Lord God omnipotent reigning forever and ever? Or cosmic rays inducing random mutations that give a certain population a slight edge, so they live a while longer while their competitors go extinct? MacLean was asked, “Do you know of any other atheist or humanist choir groups that exist?” Her answer was very telling: “Unfortunately, I do not,” she said, at least not in the U.S. There’s one in London and another in Sydney, Australia. That’s it. That makes three atheist choirs. In the world. For my part, I wonder how far you’d have to go to find three Christian choirs. Not very. If you live in a medium-sized town in America you could probably find thirty. Or 300, easily, in any larger American city. The low number of atheist choirs makes perfect sense to me. Singing is for celebrating. It’s for something far greater than the “sacredness” (whatever that might mean to an atheist) of “every sperm” (really?). Music is for expressing the heart, not for communicating cold “reason.” It’s for love and loss and beauty and pain. I pray that Amanda MacLean may find true healing for her soul. She’s going to need to look somewhere else for it, though. For there’s a very good reason there are dozens, maybe hundreds of Christian choirs, in the towns where you and I live, compared to three atheist choirs in the whole world. Editor’s note: The interview on which this article was based was altered without notice on its web page after this article was published. Some of the discussion there was removed, including some that was quoted here; and in particular there is no longer any mention of an atheist choir in Sydney, Australia. See the discussion in comments for more. Three atheist choirs, huh? Maybe that’s what the three frog spirits of Revelation are doing these days to kill time. What is she talking about, as a gaytheist she doesn’t believe she has a soul. Here at the apex I’m a winner. All are winners, even the sinner. I wonder what they would say if you asked them how creation or enjoyment of music fits into the evolutionary model. Athe ists just sing the blues. For god less ex is ten tial ism. For Athe ists there’s no good news. They’ll never sing a song of faith. In their songs they have one rule: the “he” is al ways lower case. But they do have Sun days free. 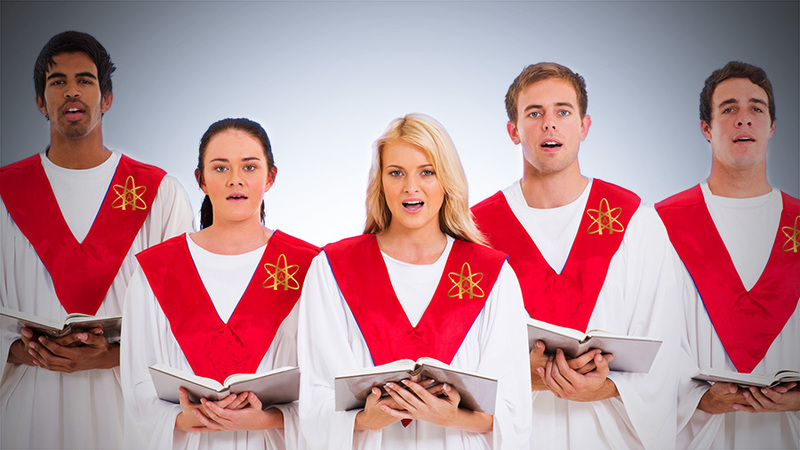 As churches keep dumping hymns and moving to rock bands the choir count is thinning. It is simply not true that there are only 3 atheist or humanist choirs in the world. The person interviewed spoke as if she knows what she’s talking about. Do you have any sources or further information to add? I’ll be happy to make corrections. It shocks me that you need me to inform you about atheistic or humanistic congregations that exist in this country. Are you really unfamiliar with them? This quote doesn’t seem to exist. It doesn’t appear in the interview cited. The interview was altered with no notification of the change. That’s shabby practice. There’s also no longer any mention of Sydney, Australia. Perhaps there are only two atheist choirs in the world. I agree that it is shoddy practice. A web search reveals the choir in Sydney is real, and there’s also a “Greater Manchester Humanist Choir” that’s been active for a while. Its “no audition required” notice indicates it’s a fun choir, not a serious one; which is okay, lots of church choirs (probably most) require no audition, but it might be why MacLean didn’t mention it. Anyway, that makes four that I can find. 3) Washington Ethical Society (a Humanist Congregation). I would suspect between the American Humanist Association, Ethical Societies, Unitarian Universalist Congregations, and others, there are probably several dozen.